Working on conceptualising the Ultraversity model and have taken a Venn diagram approach to try and encapsulate the major components and show how they interrelate. Like many models, it is an over-simplification and has flaws. NB Ultraversity is a research project that offers a full time, undergraduate, workplace, research degree that is wholly online. The programme is 2 years old, has approximately 300 undergraduate students registered at Anglia Polytechnic University in the UK and will have its first small cohort graduating in 2005. 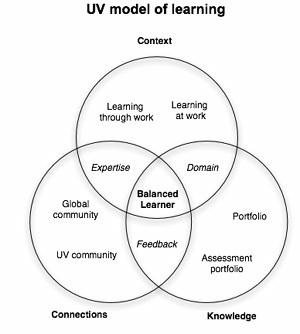 However, I wanted to encapsulate how the model works and then move on to explore (in a following Blog) what the characteristics of a ‘Balanced Learner’ might be that enables them to make the Ultraversity model work for them. At the heart of this model is the learner who is responsible for driving this personalised experience with the help of a learning facilitator (tutor/lecturer). The above model can also be seen as a representation of how we se the ICT technology supporting the learner in connecting with others and allowing them to express and evaluate their thoughts both internally and externally with different audiences. This is the workplace and is where researchers undertake their research. It is important to recognize the pool of expertise that resides to a greater or lesser extent in their workplace. It is also important to understand that by developing the cognitive tools such as reflective practice and critical thinking skills researchers are able to define their subject and domain of expertise. These are made possible by the technology and encompass the communities of Ultraversity researchers (students), invited guest experts, learning facilitators, and a technical and administrative team. This is of course only part of the equation as researchers can access the â€˜globalâ€™ online community through Blogs, email, forums, etc. The learner captures their knowledge in e-portfolios and in some instances in hard copy. There is an important distinction to be made between that which is captured for the purpose of assessment and that which forms part of the portfolio of learning where a researcher may reflect, collect artifacts, or store feedback that they have been given. This entry was posted in Learning thoughts on June 20, 2005 by Stephen Powell. I feel more attention could be paid to the development of responsibility in a societal context. This touches on a number of the elements of your conceptual model – ethical and moral issues in in framing and negotiating an action enquiry, beneficial research methodology which is not harmful to those involved, learning together in community or learning set, to name but three. But for me, the greatest of these responsibilities is to offer effective public access to the outcomes of learning, sharing the benefits and evaluating the impact made in doing so – this is embodied in the key concept of exhibition. Yes, thanks for these thoughts Richard. This leads me to the idea of impact and legacy which are particularly topical in the light of this weeks live8 concerts and the G8 meeting on Wednesday. I will consider if the diagram can better embody these ideas and then expand upon them in the explanation.